Throughout his life, Scott G. Hawkins has been a thoughtful and effective leader who sees beyond the day-to-day issues and focuses on long-term goals. As president of The Florida Bar in 2011-12, Hawkins guided that institution through a turbulent period when the state Legislature attacked the judicial merit retention principle. 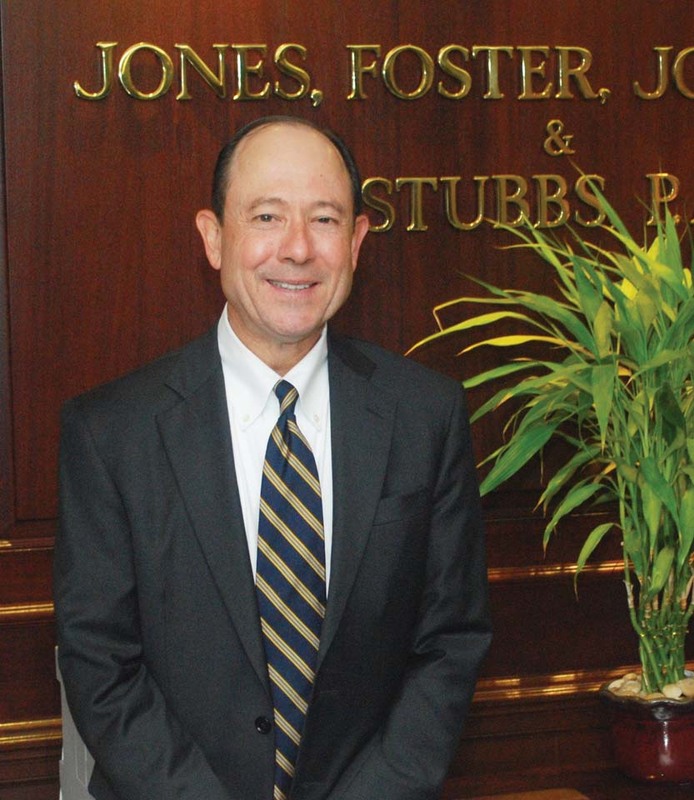 And as vice chair of Jones, Foster, Johnston & Stubbs, P.A., in West Palm Beach, Hawkins has helped his law firm develop a robust growth strategy after the long recession. In recent years, Hawkins’ practice has included disputes regarding intellectual property rights, trade secrets, covenants not to compete, environmental and land use matters, eminent domain, and claims arising under federal retirement plan regulations. His clients include a wide range of information technology and life science companies, as well as employers, land owners and insurance companies. For each matter, Hawkins assembles a team of attorneys and other professionals to handle the case in an effective and cost-efficient manner for the client. He also strives to maintain constructive relationships with his legal adversaries. “I want to be able to have a meaningful dialogue with them and see if we can work out the main issues, while being a strong and persistent advocate for my client,” he says. That carefully considered approach to litigation has won Hawkins the respect of his peers throughout the state. “I have had the good fortune to work with Scott both on Florida Bar matters and in high-stakes commercial litigation,” said John A. DeVault, III, a partner at Bedell, Dittmar, DeVault, Pillans & Coxe, P.A. in Jacksonville. “He is a skilled and effective trial lawyer judges respect, and a person who instills a sense of trust and confidence in his clients. Hawkins is a native Floridian who grew up in Tampa. His parents, Richard Paul Hawkins and Barbara Wells Hawkins, married in 1956 and moved from Canada to Florida, where his father launched a contracting business. Growing up, Hawkins enjoyed school – especially the social sciences – and played varsity golf at Chamberlain High School, where he was newspaper editor. He also received a dose of foreign culture, spending three months with a Brazilian family on an American Youth Exchange program. At the University of Florida, Hawkins earned an honors degree in economics, and served as president of his fraternity, and was very active in student government and Florida Blue Key. During his senior year, he also managed George Kirkpatrick’s campaign for the state senate, and helped the Democrat win election in the Reagan landslide year of 1980. Hawkins went on to earn his law degree, and then worked at the UF College of Law in administration and fundraising. He then spent a year in Scotland as a Rotary International Foundation Scholar, earning an MBA from the University of Edinburgh in 1985. He and his wife Lisa VanderWerf Hawkins have been married since their student days, and have a daughter Allison, who now works in the University of Florida museum system. Long active in the Palm Beach County community, Hawkins is a former president of the Palm Beach County Bar Association. He was awarded Palm Beach Atlantic University’s American Free Enterprise Day Companion Medal in 2003.